Three Women. One Red Pen. A Whole Lot Of Snide and Cynicism. Well, folks. It was fun while it lasted. As you can see, not much has been happening on this blog lately. First: It's amazing how much can change in a couple of months--both in our personal lives and on the writing front. A couple of us have signed publishing contracts, and so the need to write, edit, market, promote HAD to take preference over this blog and the services we were providing. Second: Running this blog, critiquing submissions, providing feedback...well, that's a LOT of dang work. We weren't getting paid for this service. We had a concept and we went with it--for free--not realizing how much time it would involve with very little (nothing) in return for our effort. Third: Probably the biggest factor that made us come to this decision, was the fact that a good portion of the submissions we received just weren't ready. They needed more revision. We were wanting to give out reviews on AMAZING, fully complete, well edited novels. 90% of what we received didn't come close. So we've shut it down. We've moved on. 3 entries "3 out of 3 hook'ers liked my book"
5 entries "2 out of 3 hook'ers liked my book"
We just requested for our second full manuscript! 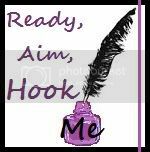 Ready Aim Hook Me began in 2011 as a community of writers and readers eager to talk about the stories that rocked their worlds, and which ones they couldn’t pick off the street with James Bond and a million bucks. We’re composed of three hard-working girls practiced in the art of reading, writing, and critique, shamelessly propositioning unpublished and published writers to show us what they’ve got. Will you hook us in your first five lines, five pages, or will you take us all the way? Spray it! Don't Say It! So Who are You Going to Be This Year? I once heard someone say that getting published in romance was like throwing a hundred women in one room with a chain saw and locking the door. Only the last one standing would make their way out. I would like to say that's true, even if only for entertainment sake. I'm sure that the conference would be a lot more entertaining to outsiders if we were indeed that vicious. Our attendance numbers would skyrocket! In fact, I'd bet the men would be all lined up and shoveling in the popcorn if it were true. It might even make for great reality TV! Course the men's mere presence would probably distract the best writers in our genre and we'd loose some valuable heads! I attended the Utah Heart of the West conference this weekend. Surrounded by throngs of starry-eyed romance authors and only a handful of editors and agents to pitch to. Believe it or not, we actually behaved ourselves. We practiced pitching together. Gave each other constructive feedback and we had a blast doing it. There were no hurt feelings--at least that I could tell. And the end result after pitch sessions was nothing but positive if not immense thanks to our peers. Newcomers to the conference were embraced with open arms. The comedy and the alcohol were free flowing--Shhh! but don't tell anyone. This is the straight-laced state after all. I think there might be some kind of unwritten regulation about boisterous Yauuups! and laughter that late at night. The only tension I found at conference was my own. Shaking like a leaf in front of the entire lunchon as I presented this year's Heart of the West Writing contest winners. And what an honor! When I read out the names, those winners in attendance were cheered and congratulated without restraint! True, the road to publication can be much like a game of roulette. There's a chance you may publish and a chance you may not, but I can say that the women at the URWA will work hard with each other, through strength and support, to get there. Word choice is huge when it comes to writing. In one of the Reluctant Hook’er’s posts, she did her best to convince us that even the first word is important. Some may agree, and others won’t. I know someone who would agree—pre-Katie Holmes era. At a recent writer’s convention, the Reluctant Hook’er and I wandered from class to class in our best Hook’er shoes and listened to published writer’s on various topics. One of the things that stuck out the most, besides one ladies’ Richard Simmon’s Style Hot Pink Sparkly mess of a hat, was making sure writing is show not tell. So what was it about Tom Cruise’s “you had me at hello”? I know it was a movie but one of the most important things to do with your words is to make us forget we are reading, make us see it—like a movie. Right before this scene, the show-me-the-money guy made his career with a great catch and a little dance. As cameras surrounded him, he took a call from his wife. We had already seen the couple’s relationship contrasted throughout the movie. Cuba and his wife loved each other. They kissed, pawed at each other, and fought with passion, all the while, Jerry and Bridget Jones exchanged awkward glances and feigned affection. I know that sounds ridiculous and something you would never do in your writing, but I see it so many times. It’s called R.U.E. and if you’ve read my blog before you’ve probably seen it pop up. Resist The Urge To Explain in your writing. Don’t sell your reader short. We aren’t totally stupid. We get things. We can read between the lines. Show us the need Jerry has for his wife, make us believe it, before the scene above even happens. We need the experience. We need to forget we’re reading a book. We need to root him on, still wondering if he’ll do what’s right. So, let’s test your knowledge. Which of the following sentences is telling and which are showing? 1. 1. “I like your hat,” she said sarcastically. 2. 2. My mind stirred with trepidation. 3. 3. I saw the look in his eyes and I knew he wanted me. 4. 4. The jagged pieces of broken glass reminded me of my father, unapproachable and dangerous. 5. 5. The crisp evening bit at my cheeks, freezing my tears, it was then I knew I’d always be alone. Show me your skills if you want. Rewrite any of the sentences you think are telling. Show me the money. I don't like questions. Not on query letters. Not on book descriptions on Amazon or on back cover book blurbs. I especially don't like characters asking internal questions either. From a book cover: He must win her love to save her life, but will he be able to convince her that he's her one true love before it's too late? Umm...should I care? Because I don't. I don't even know the guy. He could be a total jerk. Maybe she's better off without him. Narrative: Did she think she could calm the babe when none of the experienced Puritan matrons could? 'Twas not a punishable offense to offer one's aid, was it? Of what consequence was the woman's pride when the babe's life was in jeopardy? Was she listening to his hungry wails, her heart breaking as she watched him starve to death? I ran all these questions together even though this is not how it is presented in the book--but these questions are found within four consecutive pages. That's far too many. This particular book was littered with internal questions. It kept pulling me, as a reader, out of the urgency of the situation by making me come up with answers. Reading shouldn't be a test. 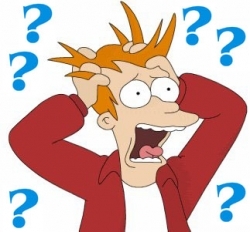 The problem with posing questions is that as a writer, you've taken the situation and reduced it's urgency. You are now asking the reader to "fill in the blanks" and most likely the answers you are hoping for won't be the ones you actually get. Never underestimate the power of a STATEMENT. Every one of those questions could have been reworked and turned into statement that would have been far more powerful than any question ever could be. AND readers gravitate to powerful writing as well as agents and editors (take a a look at Query Shark and her reactions to query letters that pose questions as a means to hook the reader--she's not too fond of them). So if you think that by posing a question in your book description on Amazon will hook your readers into buying it, or if you think adding rhetorical questions in a query letter will lure the agent into requesting a partial, you may want to think again. I am only one person, but I know I'm not alone when I say, rhetorical questions don't hook me--they turn me off from what could very well be a wonderful story. He must win her love to save her life, but he will need to convince her that he's her one true love before it's too late. Now that her mother knows her past, Clara is afraid her mother will reject her again. She hoped she'd have the ability to calm the babe despite knowing the other Puritan matrons could not. (Okay, these aren't the best rewritten, but bear with me. Hopefully you can see what I was trying for). So, the next time you see a writer pose a question, or you're thinking of writing one, ask yourself: Did this question produce the response the writer was hoping for? Did the question add to the narrative or distract? <---These questions are for discussion purposes, which is the action I'm hoping for :) Tell me what you think. I'd love to know. Browsing through the endless collection of Halloween costumes this year, I found myself wondering exactly what kind of Halloween celebrationist I am--and no, celebrationist isn't really a word, but go with me on this. I figure the Halloween scale must run from Pruney-faced, dress-up fuddy-duddy, to costume awesomealist. And you remember the awesomealist. Those that make Halloween costume history by getting into full character and most likely annoying the hell out of everyone around them. They make a major statement and are difficult to forget. I'll readily admit that can be both a good and a bad thing. Me? I figure I must be somewhere in the middle. I dress up every year. I pick on friends and coworkers until they dress up too, but the end result is only semi-enthusiastic. I get that dopey tone in my voice when someone asks. "Now what are you supposed to be?" Which by the way, must go down as an epic Halloween fail in my book. If you have to explain your costume, it isn't a costume. It's a candy-melted-mistake. You know, like the little candy corn blob that went terribly wrong in production. As a writer I feel that I put myself into different perspectives all the time. But like my costumes, am I only going in semi-enthusiastic mode? It's an easy gear to slip into when your audience is on your mind. Or when you have to pitch your book in public. 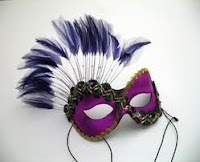 During last year's URWA writer's retreat I attended, we were encouraged to take masks with us to the keyboard. A way to put aside the outside world and be someone else jabbing the keys. It works pretty well too. So let's hear it. How are things going? Let's open a forum to see just how well our writer friends are fairing at the keyboard. Who's dressing up, and how's it working for you? Everyone has their home. Mine happens to be in the majestic Cache Valley. 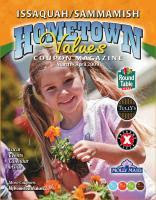 Where farm animals still graze on the outskirts and that small town mentality reigns supreme. Where everywhere I turn, I find a story about the time I nearly wrecked your car, or kissed my first boy. I could go on and on. There are locations too, like The Blue Bird restaurant, where they still make their own chocolate and gleaming, fifty-style soda dispensers crane over the edge of the bar. That place has hosted countless prom dates gussied and gleaming for their big night—so has First Dam for that matter. It’s the most famous make out spot in town. Where fuming father’s pull their daughters from back seats, and a twinge of familiarity hits them. Not only for the coveted parking spot, but for the look of fear on the young man’s face. I kept expecting the maniacal laughter and wringing hands to follow. They didn’t. Because he was right. It’s not always the family ties that bind us there either. There’s some kind of magnetic pull that draws us back to our homes. (Your comments are welcomed and highly encouraged. The author of this first paragraph submission is looking for all the constructive criticism they can receive to improve their opening hook. Do you agree with us Hook'ers? Disagree? Were you hooked and would want to read more? Let this author know). Villeen’s father should’ve murdered her eldest brother. Now… now she’d have to finish it. She clenched her eyes shut, unable to look at the heap of rags in the corner. Pale flesh peaked from the half-shredded brown robes. The corner of a book dug into her breast, but she ignored the pain, only clutching it tighter, wishing she’d found it earlier. Villeen’s father should’ve murdered her eldest brother. Now… now (Not sure you need to echo this--I'd almost like a clarification, something along the lines of: Because he didn't, now she'd have to finish it. Does that make sense?) she’d have to finish it. She clenched her eyes shut, unable to look at the heap of rags in the corner. Pale flesh peaked from the half-shredded brown robes (I like this image--just be careful not to add to many modifiers). The corner of a book dug into her breast, but she ignored the pain, only clutching it tighter, wishing she’d found it earlier. I like how this begins. You've tossed us into some type of action, that is for sure. I'd read on. I do wish I had a better sense of of her feelings toward her brother. She clentched her eyes so I assume she doesn't want to kill him, yet the first couple of lines leave me thinking maybe he needed to be killed and she wants to kill him. The first line is a pretty good opener, too. This has mystery and I like that. I think you definitely need to work on it a bit more. Make sure your word choices are spot on. Clench and clutch sound too similar. They are great verbs, but too close and would alter the sound of the piece. Same goes for rags vs. robes. The second line makes it read a bit like a back of blurb sentence. I'm not a fan of ellipses used for drama. It is artificial. Don't force me to feel a dun, dun, dun moment--just show me, make me feel the dun, dun, dun all on my own. Resist the urge to explain, or resist the urge to dot, dot, dot. I think you're off to a good start by creating intrigue. Fiddle with the wording a bit more. I'm interested, but not convinced. Thanks for sharing. Try not to let all the color on my critique fool you. I really liked this piece. And it's not really red ink anyway it's salmon. Sort of a struggle-upstream-to-deliver-your-legacy kind of color. See, now doesn't it sound so much better that way? This first paragraph has a lot of good things going for it. It got a little confusing at the end as to what the real goal was, but overall, I like it. I would for sure read on! As I mentioned last week, D.S Tracy and I went to a writer's convention over the past weekend. During the Saturday luncheon, there was a panel of editors and agents who read what was called the "First Page Slush Pile" while we ate our meals. These first pages came from those sitting in the audience. No names were revealed. One at a time, a first page was pulled from the pile and one of the editors would start reading out loud to the whole crowd (several hundred people). Pretty daring, if I might add. As the piece was being read, if the remaining panel of editors and agents liked it, they kept their hands down and the reader would go on. If they didn't like it, they would raise their hand at the place where they, personally, would have rejected it. Once all the agents and editors hands were in the air, the reader stopped reading. Not one piece that was presented made it to the end of the first page. EVERY piece was rejected. Some were rejected by the editors and agents half way through. Others were rejected on the VERY FIRST WORD. Others didn't even get passed the first paragraph. The agents and editors were tough, BUT they explained why those pieces didn't work--too many adverbs, too many adjectives, describing the setting or scene WAY TOO LONG, not jumping into the action right away, there was nothing to hook them to keep reading. As I sat there listening, I agreed with the agents and editors on all accounts. Most of the submissions were boring, describing the color of the male characters eyes or what the weather was. Others sitting near me were getting FURIOUS. They were not happy at all by what appeared as coldness and cruelty the agents and editors expressed toward these works. One lady was even so bold as to challenge the panel. She thought it was unfair that the agents and editors rejected these pieces of "art" so quickly. She said sometimes it takes 30 pages before the story picks up and she would NEVER reject a story without reading the first three chapters. Boy was she mad (you could see it written all over her face and in the tone of her words). It was a pretty tense moment for sure. The agents and editors went on to explain just how many query letters come across their desk in a year--thousands, folks. Thousands. And this is in addition to the regular work they are expected to complete each day as well (dealing with their already signed clients, contacting publishers and editors, etc . . .) They explained that YES, sometimes they reject a manuscript based on the first paragraph. It's that fast. It's that quick. Sometimes that's all the time they have. And because they've done this so long, they can usually tell by the end of a first page if the novel is worth their time to read on. Cold. Hard. Cruel. But it is the reality. That's why it is SO important to make your first paragraph, your first page, your first chapter the very best it can be. 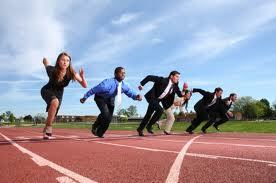 You are competing against a whole lot of other writers out there who want the same thing as you. One gentleman on the panel (not an agent or editor, but a well-known author) even went on to say (paraphrasing here): "It's your first word that will hook an agent/editor to read the first sentence. It's the first sentence that will buy you the first paragraph and the first paragraph that will buy you the first page." Very true. It was never made so clear to me as watching that panel of agents and editors destroy the hopes of those individuals who submitted their first pages. We here at Ready, Aim, Hook Me have been "preaching" this concept since the very beginning when we started this blog--can you hook us with your first line, first paragraph, and so on. We didn't just make this up to torture you. I promise. We just know the realities of what you're up against. Is it fair to be judged so quickly? No not at all. It's completely unfair. I will agree with you on that. Is it going to change? Nope. Agents and editors will reject you based simply on how your first paragraph reads. They will. I saw it in person. So you better darn well make your first word, first line, first paragraph, first page stand out--in a good way. Hey! Where Is The Comment Box? We seem to be having some technical difficulties with commenting. Hopefully, it is just an issue with blogger and it'll be easier in the future. Sorry for the trouble. How many hook'ers love your book? Want to find out? Whether you have a finished manuscript in need of feedback or a published novel looking for a review, we're your gals. If you think you've got what it takes to hook us from the first page to last, then check out our Contact Us page for further details, guidelines, and how to submit. Oh, and just so you know, we'll never give a negative review. Not on our blog. Not on any public site. So you have nothing to lose. Public humiliation isn't our style. We're here to lift up great authors, not tear them down. Does that mean we give positive reviews to everyone who submits? No. We may be Hook'ers but we're not easy. In fact, only the BEST of the BEST will receive our tag line, "2 out of 3 Hook'ers LOVE my book!" Or better yet, "3 out of 3 Hook'ers LOVE my book!"